Delivery of synthetic receptors to tumor cell membranes using both synthetic and biological nanoparticles led to effective treatment of cancer. A KAIST research team led by Professor Ji-Ho Park in the Department of Bio and Brain Engineering at KAIST developed a technology for the effective treatment of cancer by delivering synthetic receptors throughout tumor tissues. The study led by Heegon Kim, a Ph.D. candidate, was published online in Nature Communications on June 19th. Cancer-targeted therapy generally refers to therapy targeting specific molecules that are involved in the growth and generation of cancer. The targeted delivery of therapeutics using targeting agents, such as antibodies or nanomaterials has improved the precision and safety of cancer therapy. However, the paucity and heterogeneity of identified molecular targets within tumors have resulted in poor and uneven distribution of targeted agents, thus compromising treatment outcomes. 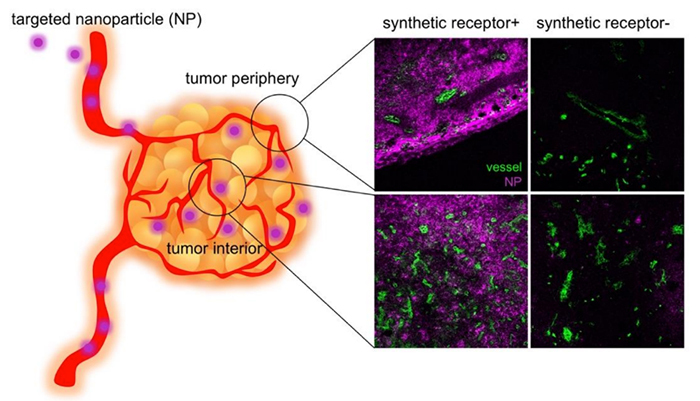 To solve this problem, the team constructed a cooperative targeting system in which synthetic and biological nanocomponents participate together in the tumor cell membrane-selective localization of synthetic receptors to amplify the subsequent targeting of therapeutics. Here, synthetic and biological nanocomponents indicate liposomes and extracellular vesicles, respectively. The synthetic receptors are first delivered selectively to tumor cell membranes in the perivascular region using liposomes. By hitchhiking with extracellular vesicles secreted by the cells, the synthetic receptors are transferred to neighboring cells and further spread throughout the tumor tissues where the molecular targets are limited. Hitchhiking extracellular vesicles for delivery of synthetic receptors is possible because extracellular vesicles, such as exosomes, mediate intercellular communications by transferring various biological components, such as lipids, cytosolic proteins, and RNA, through membrane fusion. They also play a supportive role in promoting tumor progression in that tumor-derived extracellular vesicles deliver oncogenic signals to normal host cells. The team showed that this tumor cell membrane-targeted delivery of synthetic receptors led to uniform distribution of synthetic receptors throughout tumors, and subsequently, it led to enhanced phototherapeutic efficacy of the targeted photosensitizer.